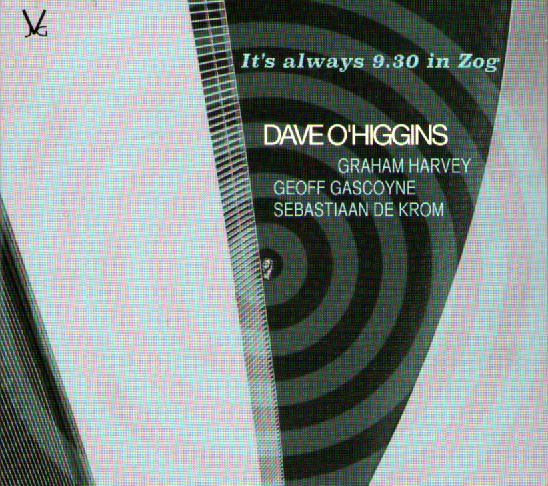 bebop spoken here: CD Review: Dave O'Higgins - It's Always 9.30 in Zog. CD Review: Dave O'Higgins - It's Always 9.30 in Zog. Dave O'Higgins (tenor/soprano); Graham Harvey (piano/Rhodes); Geoff Gascoyne (bass); Sebastiaan De Krom (drums). I read the extract below from the notes by Dave O'Higgins and I knew instantly that I was going to like this CD before the needle hit the groove (hypothetically speaking). “We’ve played a repertoire comprising contrafacts and standards mainly up until now when I decided it was high time to get writing some new original material for these guys I’ve got to know musically and socially well in that time. We're still swinging and playing changes, but there's more trust and swagger to it now - it's always a thrill everytime we play." The title track lives up to expectations. The back cover is set out like a Blue Note sleeve and the music is too - Art Blakey springs to mind. Space precludes me from explaining the title. Suffice to say it's one that Sun Ra may have given his celestial blessing to. More contemporary tenor swing on The Adventures of Liile Peepsie, the second of eight O'Higgins originals. This is surely a golden age of British tenor sax players and Dave is right up there with them. Likewise, Harvey, Gascoyne and De Krom who combine with O'Higgins to make this as tight a quartet as you'll find whilst, paradoxically, retaining the looseness and freedom that, in the right hands, equate to perfection. Alien With Extraordinary Ability - where does he get the titles from? - refers to a work visa he had to obtain to get into America to play with the Brubecks. The extraordinary ability could also apply to his soaring soprano technique more akin to a clarinet's fluency. Good skin- work from De Krom. Nothing to Lose has a Basie/Hefti inspired head. Harvey's piano, less sparse than Basie's, is a lesson in chording a solo, Gascoyne too has his say, as does De Krom whilst O'Higgins hints at Frank Foster without losing his own identity. Brixton, the first non-original, is by Brazilian accordion virtuoso Chico Chagas who composed it with Dave specifically in mind. A gentle Latin piece. Harvey brings the Fender Rhodes into play, De Krom and Gascoyne are sympathetic and the tenor sax pursues the road Stan Getz charted and maybe even passes him along the way. Timelessness by Bheki Mseleku - a tenor tour de force and, given the composer, an impossible piano solo! Three more originals - Morpheus; One For Big G (soprano swings - is this the best soprano solo I've ever heard? It may well be, piano plays like nobody's business, Big G on bass, I'm assuming 'tis Mr Gascoyne whom Dave has honoured in the title and not Kenny G, lives up to the billing before the funky New Resolution and some super sop on Humble Origins lead us to a couple of GASsers - Autumn Serenade and Easy Living. The former, as good a tune as any of the more familiar Autumn songs, sees O'Higgins stretch out without losing balance. Easy Living is simply beautiful. Ballad playing at its best. I first heard this played by Wardell Gray then later by Stan Getz. This version is up there with them. Dave O'Higgins said in the quote at the start of this post "It's always a thrill everytime we play"
Well Dave, let me tell you that it's always a thrill when we listen! The quartet tour the length and breadth of the land ' twixt now and Christmas. 33 gigs starting at Leeds on September 2 and culminating at the 606 club on December 9. You've got it in one! The Leeds gig and Edinburgh on November 22 are as near as it gets to Tyneside. PS: Where's Clitheroe? (November 24). 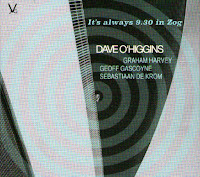 Dave O'Higgins - It's Always 9.30 in Zog is released September 8 on Whirlwind Records JVGO18CD. Album Launch is at Pizza Express Jazz Club, Soho on September 12. CD Review: Peter Jones - Under the Setting Sun. CD Review: Katie Thiroux – Off Beat. Ruth calls in the deputies! CD Review: Brent Laidler - No Matter Where Noir. Benny Benack III - A guy worth checking out. Matt Anderson Quartet @ Ushaw College, June 30.